Have you used the Internet for some time? If you have you will have experienced various changes over the years. My first dabble with the Internet was back in 1997. Not that long ago I hear you say. However, in the history of computing and browing the Internet it was a lifetime ago. So what about Internet browsers? 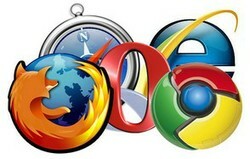 If you are a novice right now you might be saying "Eh?, what are Internet browsers"
Simple or was it as clear as mud? You do not have to worry about the ins and outs until, if ever, you feel you want to. Suffice to say your computers operating system will supply the basic software to access the Internet. If for instance you are using Windows 7 as your computer OS, Windows Explorer will be your default software. It does not have to be though. However you may find that some websites do not work well in your default browser. Take Weebly for example where this writer has her website. It will work in Windows Explorer but not efficiently. It may end up frustrating you and leaving you feeling it is more bother than it is worth. Fear not though. Feint heart never won Internet battles. There are various free browsers which you are able to download from the Internet.Never let yourself be pushed into choosing one over another. Simply choose the one that fulfils your Internet needs. Weebly for example works better in Mozilla Firefox. It also seems to work even better in Google Chrome.It will of course depend also on your computer's operating system. If you are using a website and struggling to find the most suitable browser try contacting the site's admin team and asking their advice. You can have as many browsers as you like on your Computer but it is more pratical to stick with two or three and have one as your default browser. Remember browsers, like all other software, change with the times. Make sure that you upload the latest and most suitable version for speed and efficiency of Internet access. That is assuming that it matches your OS version. Your Internet Browser is your window to the World Wide Web. The better it is, the better your browsing experience will be. I'm a firefox fan. But perhaps that's just because I never tried chrome? I think choice of web browser matters. I used Firefox for reading articles, and Chrome for watching videos online. Now I use only Chrome. I find it the best one on market. My firefox stopped working as it was. I think newer versions became slower with so many add-ons and "improvements". Very good article, and timely for me. Over the years I have noticed persistent pesky problems with web pages. Sometimes fiddling (as in using Compatibility View) with settings would work, but there were a lot of troubles with seemingly no explanation. I recently changed to Google Chrome. What a difference! The browser runs faster, is easier to maneuver, and I swear, not a single problem yet. I have been running this baby for about 3 months now. I wish I had changed long ago. I often see a big difference in my internet experience depending on which browser i use, so i would agree that your choice of browser matters. Thanks fit. Browsers are much more important than they used to be I think.